It has long been recognized that, in order to reduce institutionalization, it is necessary to develop a range of residential options that provide supportive services. Given a choice, most people with long-term care needs would prefer to receive services in their own homes. However, some people prefer to live in residential settings other than their homes for a variety of reasons--such as the desire to have someone available 24 hours a day to meet unscheduled or emergency needs because they feel safer in such a setting. This preference is reflected in the recent private-sector growth in various forms of supported housing arrangements (called assisted living or residential care) for persons age 65 and older. Services covered by or in an assisted living facility are governed by state law and regulations. There are no applicable Federal statutes, other than the Keys Amendment to the Social Security Act, which is applicable to board and care facilities in which a "substantial number of SSI recipients" are likely to reside. State rules vary widely, and many are currently being updated because assisted living is a relatively new concept, not envisioned by many state legislatures or rulemaking bodies in the past. Using Medicaid to pay for services in assisted living settings for elderly persons is of increasing interest to states looking to offer a full array of home and community services and to reduce nursing home use. By 2000, 35 states were using Medicaid to reimburse services to support assisted living for people with long-term service and support needs. Twenty-four states cover services in assisted living settings under 1915(c) waivers; six cover it in their state plans through the personal care option; three cover it in both the waiver and the personal care option; one covers it through an 1115 waiver; and one covers it under a 1915(a) waiver. Assisted living may refer to a generic concept that covers a wide array of settings and services, or to a very specific model--or both--depending on who is using the term. Twenty-nine states have a licensing category called assisted living, each with its own definition. Assisted living is also often used as a marketing term for facilities that may be licensed under another category, such as residential care facilities and personal care homes. The term is even used by facilities that are not licensed to provide services but whose residents receive services provided by outside agencies. CMS includes a definition of assisted living in the standard HCBS waiver application, but states have the option to use a different definition. Assisted living is used here to mean care that combines housing and supportive services in a homelike environment and seeks to promote maximal functioning and autonomy. Medicaid will pay for services provided in assisted living facilities as long as the "homelike environment" is preserved. Thus, Medicaid will not pay for assisted living services if the assisted living facility is located in the wing of a nursing home (or ICF/MR). Emergence of assisted living as a residential rather than an institutional model--combined with changes in state licensing regulations--has provided many people who need supportive and health services with an important alternative to the nursing home. This type of living arrangement is very popular among private-pay older persons and their families. Covering assisted living through Medicaid provides safety net funding for this group, many of whom may one day be unable to afford it out of their own resources. The logistics of setting up an assisted living program can be quite complex. Most important is the recognition that assisted living is more than just a setting for potentially cost-effective service delivery. It represents a philosophical approach to residential services that supports independent living, autonomy, and consumer choice--a philosophy that should guide decision making for regulations and payment policy. In making such decisions, states must address a number of key issues, each of which is discussed in turn. Determining what population will be served will depend in large part on the state's current long-term care system and its policy goals. Is assisted living intended to fill a gap in the current set of options? Will the target population be different from the population usually served in board and care facilities? Is assisted living intended to enable people who cannot be served in their homes to avoid institutionalization? Once these questions are answered, the state must decide which age groups will be served, and whether services will be designed to address the specialized needs of specific populations (e.g., persons with dementia). It is also crucial to make certain that licensing and other facility regulations in a given state match the target population. For example, if the state wants to target nursing home-eligible beneficiaries, the assisted living facilities will need to be able to serve a population with a nursing home level of need. The definition of assisted living varies from state to state and sometimes from residence to residence. Some states have used regulations or licensing requirements to define assisted living services. States using Medicaid HCBS waivers define the service to suit the purpose of their particular program. A variety of service delivery models are possible. The assisted living residence may be the provider of services, for example, or the service provider may be a separate agency. Yet a third alternative is to consider the assisted living setting a person's home; this permits a state to provide home and community services to persons in assisted living through the existing delivery system. Whatever the model chosen, it is important to note that assisted living in no way compromises a person's right to receive other Medicaid services. The overriding criterion for receipt of services under any model is medical necessity. Personal Care Option or Waiver or Both? State licensing rules set the minimum requirements for Medicaid providers. The Medicaid program may set more stringent standards if desired, however. For example, some states allow facilities to offer rooms shared by two, three, or more residents. But since one of the purposes of assisted living is to foster independence and autonomy, some state Medicaid programs will only contract with facilities that offer private occupancy unless the resident chooses to share a room/unit. Some states also require facilities contracting with Medicaid to offer apartment-style units rather than bedrooms. (These include Oregon, Washington, and North Dakota.) 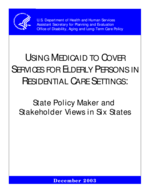 Further, if licensing rules do not include sufficient requirements for facilities serving people with Alzheimer's disease, the Medicaid contracting requirements may specify additional training or other requirements. Medically needy beneficiaries are persons who, except for income, would qualify in one of the other Medicaid eligibility categories (such as being over age 65 or meeting the SSI disability criteria). Medicaid payments can begin for this group once they have spent down--that is, incurred expenses for medical care in an amount at least equal to the amount by which their income exceeds the medically needy income levels. The medically needy eligibility option can allow people who have income greater than 300 percent of SSI to become eligible for Medicaid services. But Federal law imposes two significant constraints on the use of this option: The state must cover medically needy children and pregnant women before it can elect to cover any other medically needy group. Additionally, the state may not place limits on who is eligible for Medicaid by using such characteristics as diagnosis or place of residence. Thus, it cannot use medically needy policies to extend Medicaid services only to HCBS waiver or assisted living beneficiaries. The maximum income eligibility limit that a state medically needy program may use is based upon its welfare program for families--levels that are typically lower than SSI. The income level must be the same for all medically needy groups in the state (i.e., states are not permitted to establish higher income eligibility levels for selected subsets of the medically needy, such as beneficiaries in assisted living settings). These rules have several implications that states need to consider when trying to make the medically needy eligibility option work for higher income individuals in assisted living. (1) These individuals may find it more difficult to incur sufficient medical expenses to meet the spend-down requirements while living in the community than they would in a nursing home. The higher their "excess" income, the higher the amount of their spend-down--with the implication that only those with extremely high medical expenses may qualify. (2) Community providers are less willing to deliver services during the spend-down period, since payment cannot be guaranteed and collection may be difficult. (3) Spend-down rules combined with low medically needy income-eligibility levels mean that individuals may not have enough total income to pay both the bills they incur under the spend-down provision and the room and board component of assisted living. This is ironic since they start off with more income relative to other eligibility groups. As of the publication date, HCFA is actively examining this issue to find possible solutions (watch the HCFA website for updates). Unless the monthly rate is considered reasonable by assisted living facilities, they will not be willing to contract with Medicaid. In some states, rates in the $1500-$2500 a month range may be needed to attract enough facilities to serve Medicaid beneficiaries. When considering what rate might be necessary and reasonable, states might sample the rates charged by facilities (excluding very high end facilities) to assess (a) how they compare with Medicaid nursing home rates and (b) how many facilities might potentially contract with Medicaid at rates the state might be willing to pay. It is also important for the state to be sensitive to the potential need to set payment levels that vary based on the assisted living residents' current needs. Doing so will enable people whose condition deteriorates to stay in the assisted living facility rather than having to move to a nursing home. A number of states use such tiered rates (including Arizona, Delaware, Oregon, and Washington). Rates set by case mix (as used in Minnesota, Maine, Wisconsin, and New York) also create incentives to accept people with high needs and retain people whose needs increase. Flat rates, in contrast, tend to force facilities to discharge residents whose needs exceed what can be covered under the rate. As a final point, instead of reimbursing facilities on the basis of specific services delivered, states are permitted to develop a bundled monthly rate. A bundled rate is easier to administer for the state under a waiver program, and for providers under any coverage option.